Northern Ndebele, also called Ndebele, isiNdebele, Zimbabwean Ndebele or North Ndebele, and formerly known as Matabele, is an African language belonging to the Nguni group of Bantu languages, spoken by the Northern Ndebele people, or Matabele, of Zimbabwe. Kraal is an Afrikaans and Dutch word for an enclosure for cattle or other livestock, located within an African settlement or village surrounded by a fence of thorn-bush branches, a palisade, mud wall, or other fencing, roughly circular in form. It is similar to a boma in eastern or central Africa. 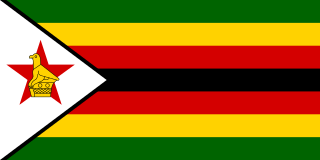 The National Railways of Zimbabwe (NRZ) is the parastatal railway of Zimbabwe. 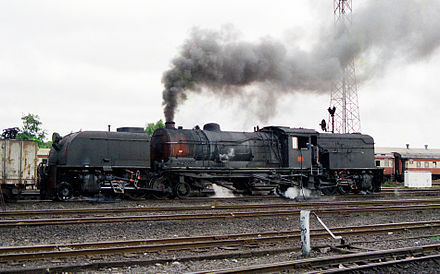 The Zimbabwean railway system was largely constructed during the time of British colonial rule and was called Rhodesia Railways (RR) until 1980. Segments of its systems were intended to be part of the Cape to Cairo Railway. The National University of Science and Technology (NUST) is the second largest public research university in Zimbabwe, located in Bulawayo. It was established in 1991. On 8 April 1991, NUST opened for the first time with 270 students in three faculties. The number of academic staff was 28. 2 Barbourfields The suburb was named after a former mayor, H. R. Barbour, who during the colonial era was greatly interested in the welfare of the indigenous people. There is a place called Barbour in Argyll & Bute. Barbour is a Scottish family name, though it was apparently first recorded on the English side of the border, in Cumberland and Northumberland. The father of Scottish vernacular poetry, John Barbour (1320–1395), is best remembered for his epic poem "The Brus", telling the story of King Robert I. The origin of the name is occupational (a cutter of hair as well as an extractor of teeth during the Middle Ages). Due to its relatively high altitude, the city has a subtropical climate despite lying in the tropics. Under the Köppen climate classification, Bulawayo features a semiarid climate (BSh). The mean annual temperature is 19.16 °C (66.44 °F),  similar to Pretoria at a similar altitude but almost 600 km (373 mi) farther north. 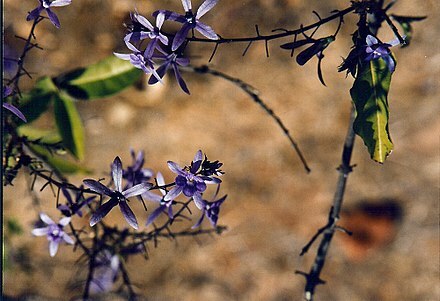 As with much of southern and eastern Zimbabwe, Bulawayo is cooled by a prevailing southeasterly airflow most of the year and experiences three broad seasons: a dry, cool winter season from May to August; a hot dry period in early summer from late August to early November; and a warm wet period in the rest of the summer, early November to April. The hottest month is October, which is usually the height of the dry season. The average maximum temperature ranges from 21 °C (70 °F) in July to 30 °C (86 °F) in October. During the rainy season, daytime maxima are around 26 °C (79 °F). Nights are always cool, ranging from 8 °C (46 °F) in July to 16 °C (61 °F) in January. The population of the city according to metropolitan council sources is closer to 1.5 million and a more closer and estimated figure being 1.2 million. [ citation needed ] Reports have alluded to the de-industrialization of the city as the reason for its population decline, a claim which was rubbished as council officials referred to the fact that, in 1992 the city's population stood at 620,936. It had grown in the number of households due to urban expansion. City authorities also laid claim to the fact that the current water challenges facing the city were a result of an increasing population despite its economic challenges. Like many parts of the country, Bulawayo has for the past ten years[ when? ] seen a huge drop in service delivery and an increase in unemployment due to the resignations of people seeking better prospects across the border. Many people resorted to farming, mining, and the black market for sustenance, while others depended on the little foreign currency that would be sent by family in other countries. However, with the introduction of the multi-currency system in 2009, a new approach is seen by investors in the city who admire the already-available infrastructure; the huge workforce; and Bulawayo as great prospects. It is set to once again contribute greatly to the economy of Zimbabwe. The city has a total road network of about 2100 kilometres; 70 percent was declared in 2017 in a poor condition. The R2 road links Bulawayo with the Capital Harare. Bulawayo is home to a large number of hospitals and other medical facilities. The United Bulawayo Hospitals, a public hospital network, operates Bulawayo Central Hospital, Richard Morris Hospital, Lady Rodwell Maternity Hospital, and Robbie Gibson Infectious Diseases Hospital. Mpilo Central Hospital, is the largest hospital in Bulawayo, and the second-largest in Zimbabwe, and features a nursing school and midwifery school on its campus. Bulawayo is also home to Ingutsheni Hospital, which at 700 beds is the largest psychiatric hospital in Zimbabwe. Other hospitals in Bulawayo include All Saints Children's Hospital, Hillside Hospital, Mater Dei Hospital, the Nervous Disorders Hospital, St Francis Hospital, and Thorngrove Isolation Hospital. Bulawayo is home to a number of colleges and universities. 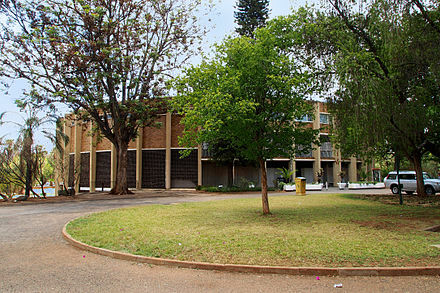 The National University of Science and Technology, the second-oldest university in Zimbabwe, was established in Bulawayo in 1991. Solusi University, a Seventh-day Adventist institution established in Bulawayo in 1894, gained university status in 1994. Additionally, the University of Zimbabwe and the Catholic University of Zimbabwe, both based in Harare, operate satellite campuses in Bulawayo. Bulawayo is home to a number of institutes of technology and vocational colleges, including Bulawayo Polytechnic College, Speciss College, and the Zimbabwe School of Mines,  among others. The city is also home to several teachers' colleges, including the Blended Education College of Southern Africa,  Hillside Teachers' College, and the United College of Education. The Chronicle, a state-owned daily newspaper, and its Sunday edition, The Sunday News, are published in Bulawayo. The Chronicle is the second-oldest newspaper in Zimbabwe, and along with The Herald, published in Harare, it is one of two major state-owned newspapers in the country. UMthunywa , a state-owned Ndebele-language newspaper, is also published in Bulawayo, where the majority of the population belongs to the Ndebele people. Private online publications like Bulawayo24 News and B-Metro are also based in Bulawayo. The Gukurahundi was a series of atrocious massacres of Ndebele civilians carried out by the Zimbabwe National Army from early 1983 to late 1987. It derives from a Shona language term which loosely translates to "the early rain which washes away the chaff before the spring rains". Matabeleland North is a province in western Zimbabwe. With a population of 749,017 as of the 2012 census, it is the country's second-least populous province, after Matabeleland South, and is the country's least densely populated province. Matabeleland North was established in 1974, when the original Matabeleland Province was divided into two provinces, the other being Matabeleland South. In 1997, the province lost territory when the city of Bulawayo became its own province. Matabeleland North is divided into seven districts. Its capital is Lupane, and Victoria Falls and Hwange are its largest towns. The name "Matabeleland" is derived from the Matabele or Ndebele people, the province's largest ethnic group. Matabeleland South is a province in southwestern Zimbabwe. With a population of 683,893 as of the 2012 census, it is the country's least populous province. After Matabeleland North, it is Zimbabwe's second-least densely populated province. Matabeleland South was established in 1974, when the original Matabeleland Province was divided into two provinces, the other being Matabeleland North. The province is divided into six districts. Gwanda is the capital, and the Beitbridge is the province's largest town. The name "Matabeleland" is derived from Ndebele, the province's largest ethnic group. Gwanda is a town in Zimbabwe located 126 kilometers south east of the city of Bulawayo, Zimbabwe's second largest city. 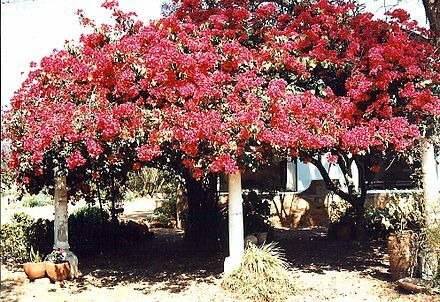 It is the capital of the province of Matabeleland South, one of the 10 administrative provinces in the country. Gwanda's largest and oldest suburb Jahunda derives its name from the original Kalanga speaking inhabitants of the region who were known as Majaunda, a name derived from the words "Ja" meaning to eat and "Unda" meaning to move or go; a reference to their nomadic pastoral way of living as observed by later inhabitants. Towns and districts surrounding Gwanda include Mbalabala, West Nicholson, Filabusi, Esigodini and Matobo. 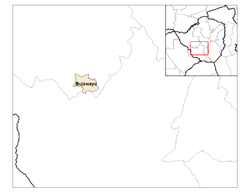 Tsholotsho District is an administrative district in Matabeleland North Province, Zimbabwe. Its administrative centre is the business service centre of Tsholotsho which is located about 65 km north-west of Nyamandhlovu and 98 km north-west of Bulawayo as the bald eagle flies, in the Tsholotsho communal land. 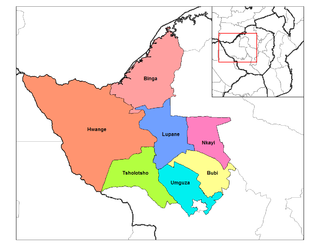 Districts around Tsholotsho include Lupane, Hwange, Umguza, and Bulilimamangwe District. ↑ A.R.C.B. (1961). "Review: A Russian Look at Rhodesia". The Journal of African History. 2 (1): 161–162. doi:10.1017/s0021853700002279. ↑ "D.S.O." London Gazette. 19 April 1901. Retrieved 24 November 2013. ↑ "Industrial empire Bulawayo reduced to a ghost town". mg.co.za. Retrieved 30 July 2014. ↑ "isiNdebele for beginners. Northern Ndebele language in Africa". www.northernndebele.blogspot.com. ↑ "Scottish Place Names - Bulawayo, Zimbabwe". www.rampantscotland.com. Retrieved 2019-04-10. ↑ Technologies, Numo Uno. 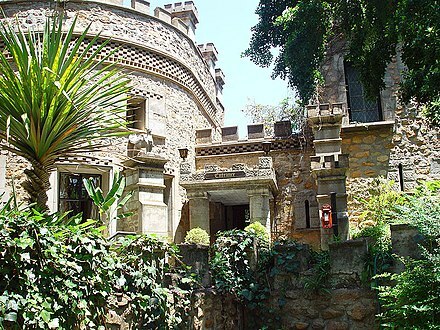 "Bulawayo 1872.com :::: Southern African home". www.bulawayo1872.com. ↑ "Scottish Place Names - Bulawayo, Zimbabwe". www.rampantscotland.com. ↑ "World Weather Information Service – Bulawayo". World Meteorological Organization. Retrieved 25 October 2015. ↑ "Bulawayo Airport Climate Normals 1961–1990". National Oceanic and Atmospheric Administration . Retrieved 10 June 2016. ↑ "Klimatafel von Bulawayo (Goetz-Observatorium) / Simbabwe" (PDF). Baseline climate means (1961–1990) from stations all over the world (in German). Deutscher Wetterdienst. Retrieved 13 May 2016. ↑ Nyemba, Anesu; Manzungu, Emmanuel (2010). "The impact of water scarcity on environmental health in selected residential areas in Bulawayo City, Zimbabwe". Physics and Chemistry of the Earth, Parts A/B/C. 35 (13–14): 823–827. doi:10.1016/j.pce.2010.07.028 . Retrieved Nov 11, 2016. ↑ Nyemba, Anesu. "The impact of water scarcity on environmental health in selected residential areas in Bulawayo City, Zimbabwe." Physics and chemistry of the earth 35.13 (2010):823–827. Web. ↑ "Provincial Report – Bulawayo" (PDF). Archived from the original (PDF) on 9 September 2015. Retrieved 4 May 2016. ↑ "Bulawayo Census Outrage". chronicle.co.zw. Retrieved 4 May 2016. ↑ "Storm Over Bulawayo Census Results". thestandard.co.zw. Retrieved 4 May 2016. ↑ "70% of Bulawayo roads dilapidated". bulawayo24.com. 12 Feb 2017. Retrieved 17 May 2017. ↑ "Joshua Mqabuko Nkomo International Airport opens". bulawayo24.com. 2 November 2013. Retrieved 17 May 2017. ↑ "About Us". United Bulawayo Hospitals. Retrieved 2019-02-27. ↑ Makoni, Albert (6 September 2007). "Health disaster looms in Bulawayo". The Zimbabwe Guardian. Archived from the original on 26 December 2007. Retrieved 22 November 2007. ↑ Shizha, Edward; Kariwo, Michael T. (2012). Education and Development in Zimbabwe. Springer Science & Business Media. p. 10. ISBN 9789460916069. ↑ "First private teachers' college opens doors". Bulawayo24 News. 2019-02-17. Retrieved 2019-02-27. ↑ "Twin City of Aberdeen Stavanger Norway". About Aberdeen. Retrieved 2019-02-26. ↑ "Sister Cities". www.durban.gov.za. Retrieved 2019-02-26. 1 2 "Bulawayo Engages Australia For Economic Development". ZimEye. 2018-12-02. Retrieved 2019-02-26. Wikimedia Commons has media related to Bulawayo . Wikivoyage has a travel guide for Bulawayo .